As one of many Nintendo fans worldwide, there is something we all seem to have in common. The expectation that games, whether it be developed by the Big N themselves or not will have what I like to call “The Nintendo Polish.” Now this isn’t a real thing and it is probably a silly little over expectation that we use to justify why we enjoy the games that we do, but what is real is the moment you turn on a game and can tell by the first minute of gameplay that the company and people that made this game really love what they do. Look no further then KnapNok Games and Nifflas’ Games’ Affordable Space Adventures as living and breathing proof of this notion. When firing up Affordable Space Adventures you are greeted with cut-scenes showing how you ended up on the barren planet that you have crash landed on. The story is told through a nice voice over with story boards that look reminiscent of something from the Fallout or Bioshock series. I loved the in-between level loading screens that would explain your ships functionality more, very similar to an old school instruction manual. 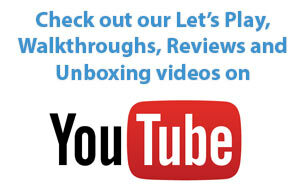 Everything has a nice finishing touch that goes above and beyond the effort you see from most indies. Playing the game solo, you will first notice the great implementation of the GamePad. This isn’t your average mirror the TV screen effort that has been all too familiar with most Wii U efforts lately, including the first-party titles from the Big N. You must start the engine in your little spacecraft with the engine button on the left hand side of your “heads down display.” The GamePad will have you looking down at a control panel like you are the actual pilot in a spacecraft. Later on you will unlock other options that will help you pilot your vehicle such as thrust control, mass, an electric engine and much more. All of the options will play a vital role in to the well being of your craft. 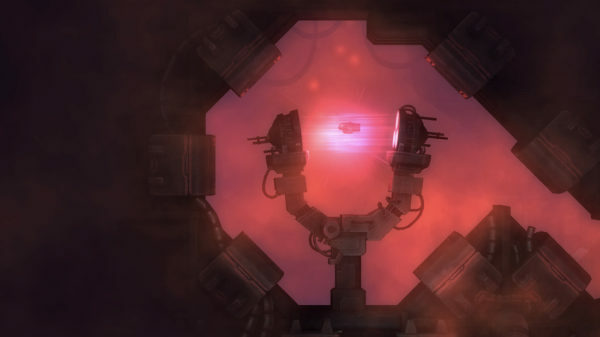 Once you encounter enemy sentries, you will scan them to see the radius in which they will effect your ship. You will also get a gauge on which they will detect you based on electricity, heat and sound. If you over do it on any of these you run the risk of getting shot down by the enemy. This is where the puzzle element of Affordable Space Adventures comes in to play. You will need to figure out ways to pass by undetected and later on get landing gear that will either stick you or let you slide along different surfaces. There are also some switch puzzles which for some reason reminded me of the indie title The Swapper from Curve Digital. The GamePad also uses it’s gyroscopes to allow you to rotate your spacecraft to fit through some tight spaces. Each level starts and begins with you exiting and then entering a tunnel. This works well as each level is usually specific to one function of the ship, making you think about how you are going to use the abilities in different ways. One of the neatest functions of Affordable Space Adventures has to be the multiplayer. The game features a three player co-op experience that splits up the roles from single player into 3 unique jobs: the pilot, engineer and astronaut. You will need to have excellent communication skills with your partners as some of the puzzles requires some extreme precise aiming. The roles that you have become accustom to in single player are split up and it is pivotal for your survival and also to avoid frustration that you work together as a team. 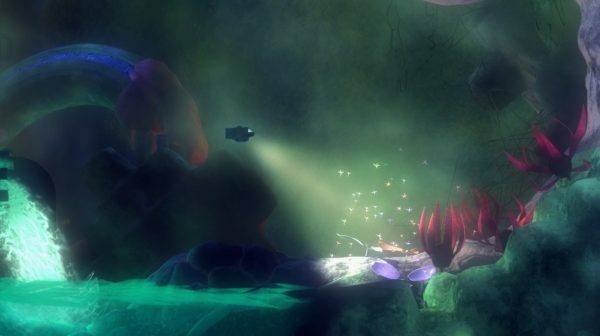 The graphic style even though stands on it’s own and has a sci-fi theme is really similar to the Trine series. This believe me is a huge compliment as I feel both titles do a great job with coloring and lighting effects on a 2.5D game engine. The scanner and headlight glow and reflect off of the environment beautifully and really give you a sense that you are there. The sound is great as well from the voice acting to the ambient music as everything comes together in a great package. 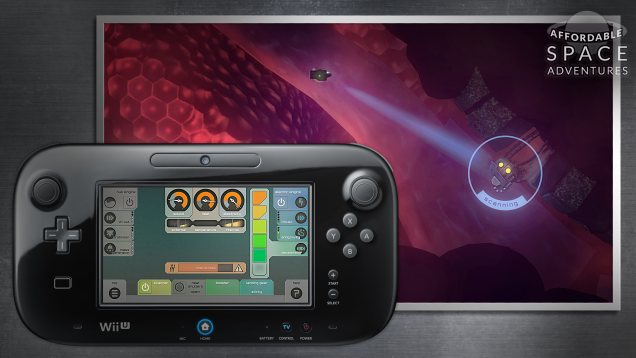 Affordable Space Adventures is a quintessential indie title on Nintendo’s Wii U home console. While lacking in “action” it more then makes up for it with unique usage of the GamePad, intricate puzzles, a beautiful atmosphere and just plain overall polish. While the price may look steep without getting your paws on it, it is worth every penny of the $19.99 asking price. KnapNok Games and Nifflas’ Games have put themselves with the likes of Yacht Club Games, Image & Form, Fuzzy Wuzzy Games, Renegade Kid, Drink Box Studios, Curve Digital and Zoink Games as top indie studios on the Wii U with a absolutely amazing smash hit.